In 1980, a pew was dedicated in memory of Mr. and Mrs. Peter Tallman at the United Church of Spring Valley. At the time the family provided a brief biography of Peter, which is the basis for much of the information in this article. We thank Alice Sherwood Gainer, the Tallmans' great-granddaughter, for pro­viding the photographs and for clarifying details. William Doherty and your editors continue to be delighted by Minnie Torkler. What goes into a picture caption? Pearl River by James Vincent Cassetta is reviewed by your editor. Markers for Kurt Weill and Lotte Lenya at the Mount Repose Cemetery and for Christ Church in Sparkill have been dedicated. 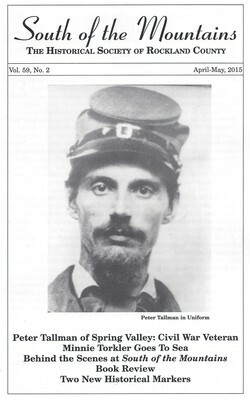 COVER PICTURE: Peter Tallman in his Civil War Uniform. From the Collection of Alice Sherwood Gainer. South of the Mountains is one of the tangible benefits of membership in the Historical Society of Rockland County. For more information on membership, click here. Single copy price of South of the Mountains is $5, including postage and handling. While all efforts are made to ensure accuracy in the articles, the Historical Society assumes no responsibility for opinions and conclusions expressed or implied by contributors. The editors welcome contributions of letters and articles. Please contact us at the Historical Society. © 2015 The Historical Society of Rockland County. All rights reserved.